As I drove home earlier this evening, I thought back and reflected on the events that I had just witnessed over the past two hours. It isn’t often that something moves me strongly enough to write about it in such a short span of time but as the thoughts rolled around in my head, I knew that this was going to be one of those times. One of my civic responsibilities that I am privileged to hold and one that I take very seriously is serving as a member of the board of directors for a fairly large regional technical college. I’ve been on this board for just over eight years and have served as its chairman for the last four, working with some of the most committed and talented community leaders you could imagine…. and we don’t even begin to hold a candle to the faculty and staff who work there. My time on that board has exposed me to a lot of wonderful instructors who give new meaning to the words “dedication” and “commitment” and earlier this evening, I got to see what it is that inspired one particular group of instructors to do all the things that they do. Among my duties as Chairman is to deliver the greetings and a short message on behalf of the board to the degree and technical certificate graduates of the college. This graduation used to take place once each year but when we merged with a smaller college, coupled with explosive growth in student enrollment, these graduations became more frequent. I also knew of the college’s other graduation ceremony, the one held for students who came back to school to earn their high school diploma in the form of a GED, but I have to confess that I’ve never been able to attend the other one because it always fell on nights where I had a conflict. For the GED ceremonies, the Vice Chair would usually deliver the message. This year however, with the change to the semester system, I was able to attend and as I drove to the facility where the graduation ceremonies would be, I held the expectation that this one would be little different from the degree graduation ceremonies I’d been to. I also believed that it would be more like the traditional high school ceremonies I’d attended, which in recent years have become increasingly loud, noisy and and disorderly. It turns out I was wrong on both counts. I left early, allowing myself plenty of time to get there, even though I knew that parking would not be a problem for me (the best perk of being on the board) and that my seat on stage would be assigned. All I had to do was park, get robed up and go where I was told. The church we hold graduation ceremonies in is a massive facility that actually has a “nosebleed” section and probably holds a couple of thousand people. As I parked, I noticed there were not as many people here as I was used to seeing at graduations but I attributed this to my having arrived 50 minutes early. Once inside, I observed the usual sights and sounds of graduation: a mix of people, some garbed in simple black robes, huddled in small groups, the sound of cheerful banter, the flashes of cameras and cell phones snapping pictures, the voices of ushers hawking programs and directing people where to go and so forth. I took the offered program and headed on to the robing room, an anteroom set off to the side of the auditorium where the faculty will gather before the ceremonies. Like other graduations, there was a table with light refreshments set out as the faculty circulated around the room in their more elaborate robes decorated with colorful hoods that hung behind them. I heard the sound of their light chatting, punctuated with the occasional laugh, all familiar to me. Despite their ceremonial apparel, they appeared to be relaxed and enjoying themselves. This is a happy occasion and it occurred to me that these ceremonies are what they live for and work for because in a short while, the fruit of their labors will be manifested in the graduates that they will send out into the world. After donning the heavy black robe, fighting with the proper placement of the hood and making a diligent effort to forget my tam hat (this never works, someone always reminds me to put it on), we prepare for the lineup, an exercise in itself that would merit a separate story, and at 7PM, we march down the long aisle to the strains of “Pomp and Circumstance” played on the large grand piano. The auditorium is heavy with expectation as we walk and the audience comes to their feet, all standing and watching us we process out in a long, impressive line of black. Of course, we aren’t the ones they are looking for and as I got to the stage and turned around, the last of the faculty cleared the door, followed by the graduates themselves. It was a mixture of people from what I could see. Some of them looked very young, others more mature, different genders, different races, different sizes, different walks of life. The two things that they did share in common were the robes they wore and the look on their faces, something like that of a deer staring down the barrel of a shotgun…. but then, this being a high school graduation, I had to consider that this was likely the most ceremonial event they had ever taken part in and a high school graduation given by a college is as ceremonial as it gets. We took our seats and after the welcome and the invocation, I got up to give my three-minute welcome and comments, conveniently leaving my hat in the chair. I knew my words and sentiments would be similar to those used by the other speakers, words of congratulations, encouragement to keep moving forward and letting them know we were proud of them. Boy was I about to get an education of my own in being proud. I had always heard that the GED graduation could be inspirational, emotional and uplifting and as it turned out, it was all three. Our first speaker was the EAGLE award winner from last year’s batch of graduates. EAGLE, which stands for Exceptional Adult Georgian in Literacy Education, is the highest honor for students pursuing a GED in the Technical College System of Georgia. The award is given for the effort that they put into their studies and they serve as role models for over a million Georgians who never graduated from high school or got a GED. The young woman that last year obtained her GED and was selected as the winner has now finished her first year in college with the intention of becoming a doctor and returning to her community to serve others. As I listened to her story of overcoming struggles, I began to see what would become a common theme during the evening. People don’t always complete school and for a variety of reasons. Our society tends to think of high school dropouts as people who just didn’t want to do the work, got tired of it and quit and sometimes that is the case but the reality is that there are a lot of reasons. Sometimes a teenager becomes a parent very young and quits to raise their child. Sometimes a parent dies and a teenager drops out, maybe even only a year short of graduation, to go to work and help support the family. Sometimes a young person doesn’t get the help or attention they may need in school and becomes so frustrated that quitting seems to be the only way out. Whatever the reasons, this young woman and the audience of graduates that were here tonight made a conscious decision at some point along the way that they were going to get that diploma and make a better life for themselves. Our keynote speaker told an inspirational story about her own life as a high school dropout who quit school to get married and have a child. After toiling for a number of years in the textile industry doing manual labor, she realized that her career was at a dead-end because she lacked a high school diploma and could not move up without one. She went back, got her GED and soon afterwards, decided to enroll in college and continue. She achieved her college degree and then graduate school, improving her life and bettering herself along the way. Today she is a high-ranking executive working for the Technical College System of Georgia. How ironic, I thought, that the same system that gave her a new life put her in a position to help others achieve what she had done. The graduates gave her more than one round of applause as her story unfolded. 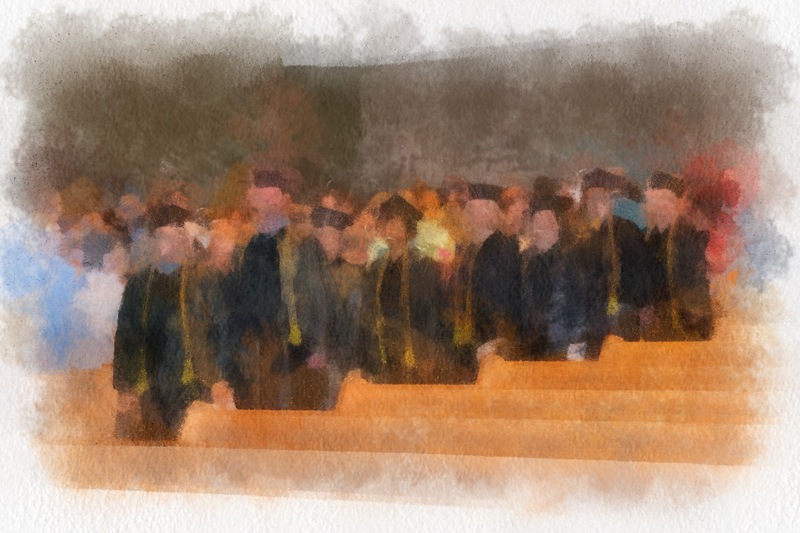 At last, the moment the graduates had waited for arrived, both in symbolism and in reality….the moment they would be awarded their diplomas. It was asked of the audience in attendance that they hold their applause until all graduates received their diplomas and I thought to myself “that will never happen”. To my surprise, it did for quite a way into the ceremony as one by one, their names were called and each one walked across the stage toward where we waited for them. I tried to study each one and I observed the differences in them as individuals versus how they looked collectively, some wearing cords denoting honor graduates or members of honor societies and I couldn’t help but wonder what challenges had each one faced to get here. What potential had been untapped because life intervened in an unexpected way? While I couldn’t really know the differences, I knew what each one had in common….they had made a choice to do this, to finish what they had put on hold once, for whatever their reasons, and now they were moving forward again. Eventually the silence was broken as members of the audience couldn’t contain their pride any longer but it wasn’t disruptive….it was moving. The occasional “that’s my brother!” or “that’s my sister!” was expected but then a child’s voice rang out as a young woman walked across the stage with the simple expression “Go Mama!”. That was what got to me then because those two simple words spoke in volumes about the significance of what had been achieved this evening and what each of the instructors present lived for. In his simple statement, he had given meaning to everything this evening represented without ever using words like sacrifice, determination, courage, stamina, achievement, pride and respect. There were the beginnings of tears in the eyes of his mother and I would be lying if I said it didn’t get to me too….and to most of us on the stage. He was proud of his mother for doing something that couldn’t have been easy for her to do, probably so she could make a better life for him. Maybe it was the first time anyone had ever cheered for her. There were more stories like this one as the procession went on and from the little sound bites that would come from the audience, one gained a pretty good idea that there were a lot of stories to be told about the class of 2012. One of them that I would have really liked to have known was about one of the last graduates who came across the stage. 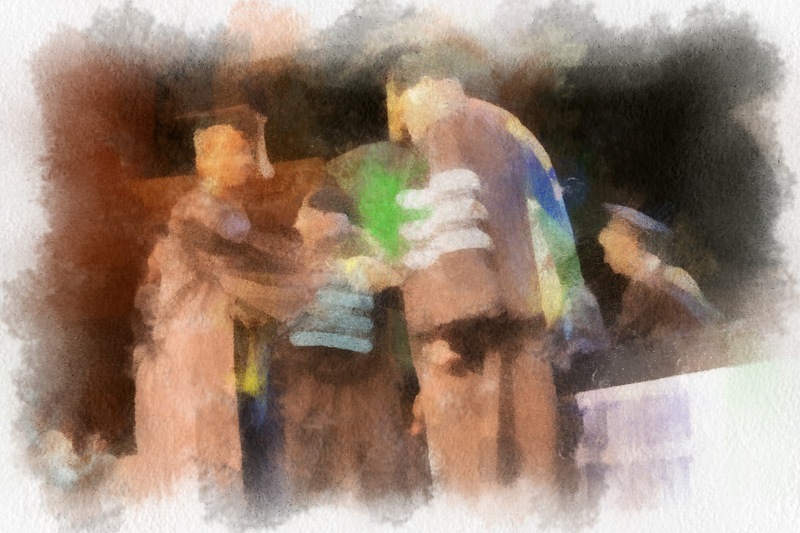 As he approached, he moved a little slower than the others who had come before him and I realized that he was by far the oldest graduate I had seen that evening and maybe at any graduation I had been to before. Applause began to erupt, not just in one section of the auditorium where he might have had family but from all over the room. The faculty began to applaud, as did those of us in the receiving line and I took special pride in congratulating him on his achievement. Moments like these are rare and for a few of those, we all shared in his success and in that of all the other graduates. This moment was theirs, they had earned it and the pride they felt in themselves was reflected on their faces. It wasn’t like that when I graduated from high school….in fact I doubt it is for many of us. Most people go through grade school, then high school, facing mostly obstacles that we make for ourselves. Those obstacles usually boil down to the choices we make while we are there….to study now or put it off until later….to go to that party or stay home and work on that term paper….to buckle down and get it done or go to the football game. When I graduated, I don’t remember that I felt pride in myself but rather excitement about the ceremony and the parties to follow, plus relief that it was over. I left the pride for my parents and the relatives that came to see me graduate to enjoy. Often this attitude carries over from high school into college, for those that go on to higher education, and it doesn’t change until that moment when adulthood begins to reshape our priorities. It was different for those who graduated from the Southern Crescent Technical College GED Class of 2012. In the case of each graduate, something had, for whatever reason, delayed them in finishing what they had begun, in some cases by several years and in at least one case, several decades. For many of them, the obstacles were real and significant, leaving few choices to them. This evening, they were achieving a goal that would give them new choices and new opportunities. Some would go back to their jobs with a better chance of promotion. Some would go back to school and keep going, achieving their degrees or learning new vocations that would give them stability and allow them to contribute even more to society…and for a few, it was just because they wanted to do it. Each one of them had undertaken a journey and walked the the longest mile to arrive at this place. A collective cheer was raised by the graduates when they were seated at last and all of us in attendance gave them their due applause and congratulations. It was a special and inspiring moment that I am sure they will all remember the rest of their lives. I know I will. This is inspiring; thank you for sharing it. I have a great deal of respect for those that go back to school later in life to complete that which may have gone unfinished, despite the many obstacles that work, family and life in general can throw in our paths. Thank you so much for the comments. In today’s world, moments that truly move you are very uncommon and treasured. And all too often, we’re too busy to notice those few rare moments. Kudos for not only recognizing such an inspiring event, but taking the time to describe it.